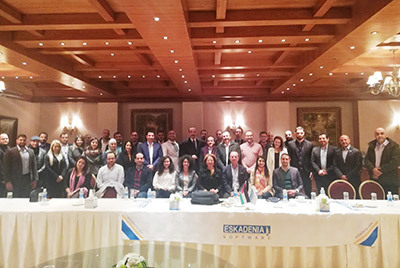 ESKADENIA Software, the leading Jordanian-based provider for software products and technologies, defined the company’s future plans, goals and objectives during its Annual Strategy Conference at King Hussein Club, Amman on the 9th & 10th of January 2019. ESKADENIA founders Nael Salah and Doha Abdelkhaleq started off the conference by showcasing the achievements of the previous year and 2019 high level objectives. This was followed by Sales Directors’, Business Unit and Department Managers presenting their objectives and strategies in the financial, products, projects, quality and competence areas; all with the mission to become a leading global provider of world-class products, services and solutions that exceed the customer expectations. Products managers, project managers and team leaders attended the meetings to contribute to the strategic planning process. A number of sessions were conducted to discuss key performance indicators and jointly set annual targets. The ESKADENIA team welcomed the sessions as a great exercise to reach consensus on the company’s annual objectives and targets. The strategy conference also included a “Food For Thought” session that was conducted by Mr. Laith Al-Qasem, Chairman of Arabian Business Consultants for Development (ABCD), presenting insights about strategic planning, roadmap focus tools and management cultures, as well as some case studies from Jordan ICT. “It was great to have been involved in setting our company goals in order to achieve greater results”. Mohammad Awadallah, technical team leader in the telecom business unit stated. ESKADENIA® Software is a two-time MENA Award Winner & CMMI® level 3 certified company that is active in the design, development and deployment of a range of software products in the Telecommunications, Insurance, Enterprise, Education, Healthcare, and Internet application areas. The company is based in Jordan and has sales activities in Europe, the Middle East and Africa; more than 85% of its sales are exported to the global market. ESKADENIA Software is a customer-oriented organization that assists enterprises and promotes businesses by use of highly effective IT strategies, solutions and tools. With a customer retention rate of over 95% in more than 25 countries, ESKADENIA endeavors as a team to augment quality and customer gratification, build up perseverance, and foster innovation. ESKADENIA Software positively contributes and strongly believes in the crucial role of businesses in the development of their communities. For more information, visit www.eskadenia.com, or contact us at pr@eskadenia.com.